We traveled in summer 2015, The property is wrongly shown on the map, it's actually the opposite direction and it is 30min drive from Marrakeck, in a complex called "Residence Garden City". On the Google map shown near P2013 and N9, which is near "Golf Amelkis". The house and pool were lovely, we really appreciate Stephanie the owner of being very nice and helpful prior to our stay. I honestly love the villa and I would rate it 5 star, however the House Staff are massive family of 3 children and 3 adults living in the basement of the property that has access to the ground floor and all their relatives visiting them, really let the property down. We value our privacy and we like a clean environment however frequent visits throughout the day and night from House Staff made privacy difficult on ground floor. The guest kitchen is shared with House Staff utilising it up to 3 times a day and cleaning is an issue. The House Staff left their personal washing including women underwear on breakfast Terrace which indicate lack of respect to the guest. "Free Breakfast" but you have to buy your own milk. The property is nowhere near walking places to eat, We accidentally found a local taxi driver called "Hassan". Hanan uses his taxi regularly, very cheap. The main restaurants are In Marrakeck Square, 30min drive to "Jemaa el-Fnaa". The food is really good only 30 dirhams for large Couscous, or Tagine, Kabab, eat any food you like, really nice. Hassan brought us there and back for only 100 dirhams. I have considered your remarks and back from my weekend in Marrakech I am surprised by the publication of your comment after reading the guest book there. In order to clarify the situation and explain to all my tenants punctual situation you have lived , hanane had just left his home village next to move to another and I allow her to come in the basement of my house to make the transition. Without , of course, disturbing the customers. I think she made moreover like laudry or manage your child during night .This does not make party of her mission. On the other hand the villa is in 500 meters behind Amelkis and it is necessary actually 20 minutes to go to place djemaa el fnaa but Djamal taxi driver is at your disposal when you wish. you just had to ask hanane to contact him. Le point tres négatif est l'entretien de la piscine. Votre retour a bien été pris en compte et mon mari est allé sur place faire le nécessaire afin de remettre en place ce qui l'ait depuis 8 ans :une personne gérant le nettoyage de la piscine. Désormais tout est rentré dans l'ordre et nous nous excusons pour ce désagrément, un message privé vous a été envoyé à ce propos. Nous avons vraiment aimé !! 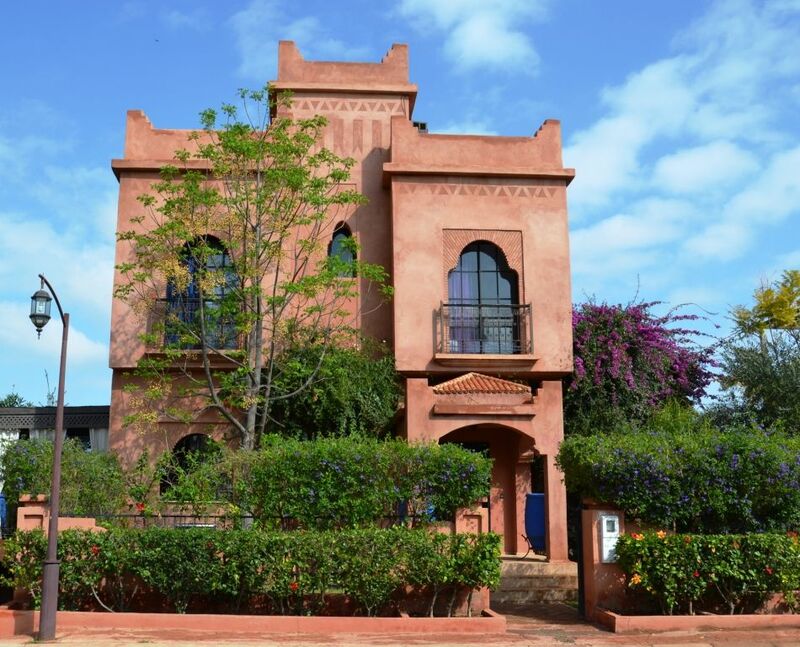 Très belle est grande maison avec une architecture typique du Maroc. Elles est très bien située puisqu'à seulement 10 minutes du centre. Le coin terrasse/piscine est vraiment fabuleux ; les chambres sont spacieuses et la literie impeccable. Gros plus : Hanane la formidable cuisinière vous concoctera de délicieux plats locaux et européens !! Un super séjour , une villa parfaite et une équipe au top, merci Hanane .